Artists of Arizona and America unite! Artists, musicians and everyone involved in the arts. 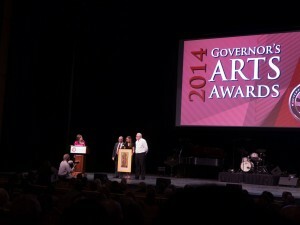 The Arizona Governor’s Arts Awards are coming up later this month. Last year our governor showed up and spoke of how important the arts are to Arizona – this after slashing arts funding from his budget. There is no sign of arts funding in this year’s governor’s budget either, and so it is time for us to remind our governor, our legislature and every other elected official that we are voters, we are educators, we are the creative forces that drive tourism as much as the natural beauty of the state. Artists in education develop the kind of critical thinking and relational understanding that is fundamental to developing young minds in science and mathematics, and ultimately in building the 21st century skills an Arizona worksforce will need to attract the kind of high paying jobs our leaders give lip service to trying to attract, but do so little to fundamentally ensure that they can be obtained. The arts are what drives downtown’s revitalization. We have power as a voting block. Demand of your elected leaders that they recognize this and restore funding to the arts and arts education at every level of government in our state and our nation. Get behind our elected officials who support the arts, arts education and public education. Put the feet to the fire of those who do not. Your vote matters, and ours collectively matter a lot. There is something all of us can do. Vote! Send emails! Make phone calls! Make some noise! Do not quietly accept what elected officials do! Artists, artist educators and educators in general unite! It is time for fundamental change. ~ by Daniel Buckley on March 2, 2016.